A few months into our relationship, the chef and I were lying in his bed looking out the window at the rain. Our relationship was still so new then; we didn't yet share a home, let alone personal things, like frying pans or sheets. But on that morning, as droplets gently tinged the glass, and I curled myself closer against his body, the conversation about our future began. "One day," the chef said as he gazed through the glass, "we'll have our own window, in our own home, to look through together." My love for John Hughes' movies, singer songwriters and poetry aside, it was, in my opinion, one of the most romantic statements ever said. We began to look for our first place the following week. Since then, we have shared one apartment, one townhouse, exactly eighteen windows and one bed (someday, we will be motivated enough to upgrade to a king). Together, we've purchased gauzy curtains and throw pillows, grapefruit spoons and an espresso machine. We've assembled shoe racks, end tables and bookcases, and, without ever actually discussing it, agreed upon a drawer meant exclusively for matches, one for takeout menus, and designated specifically where things belong both in the shower and the fridge. Over the years, we've done everything in our power to transform our houses into homes, despite the fact that we've never actually owned a home ourselves. While there are many pros to renting (never having to pay to fix a cracked toilet seat or damaged water heater), there are of course many cons when it comes to making a space truly one's own (never being able to install subway tiles or replace our beige carpeting with wide planks of knotted wood). I've talked in previous posts about how the new 2nd Avenue shop is our baby in many ways and, in recent days, I'm finding that it is starting to become our home a bit, too. For the first time in our relationship, the chef and I have had the luxury of selecting things like flooring (a basic tile for the kitchen, which will be easy to clean), door knobs (black brass) and countertops (custom made butcher block) as we continue to transform this once foreign space into something familiar, something that feels and looks like us. When the time came last week to select lighting, the chef and I tried to describe to each other what we were in search of by way of fragmented sentences, long pauses, incoherent ramblings (like butcher-y but kind of industrial but kind of inviting and rustic, but also clean) and a lot of you-know-what-I-mean. 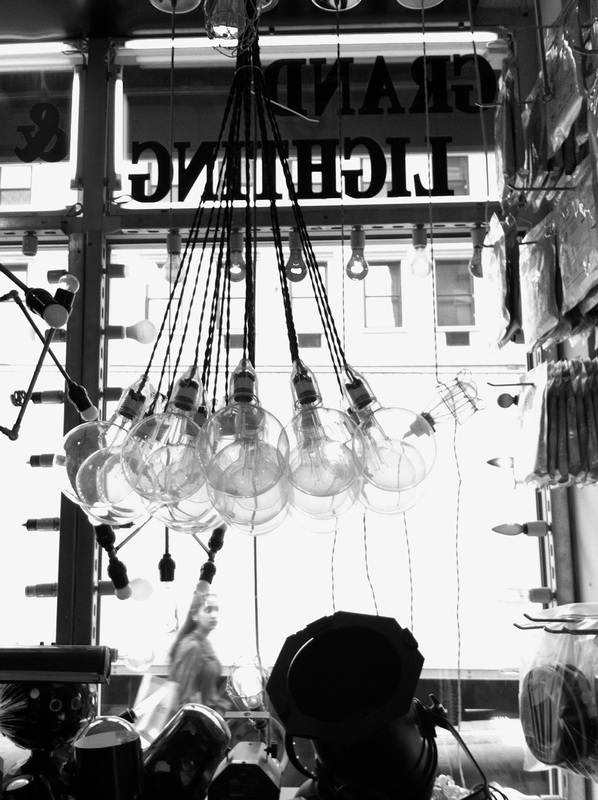 Like unique wall art, lighting fixtures speak to me the minute I walk inside a shop, whether it is food related, a bookstore or a boutique (remember that place with the colored glass globes hanging across the ceiling? or those Saint Germain bottles that were used as lamps?). By the time we made it down to the Bowery, although neither of us could quite describe it, we both seemed to know exactly what the other had in mind. The Bowery is such a strange little pocket of New York, its streets virtually absent of the types of glamour most people expect to find in the city. While you aren't likely to find a Williams Sonoma in sight while strolling along these streets, you are likely to find almost any kitchen tool, work station or bit of culinary decor that has been taking up residence in all your daydreams. There are entire blocks of storefronts dedicated exclusively to selling kitchen stools, thousands of them in unexpected shapes and colors, stacked high to the ceilings. Other blocks focus only on cooking tools, and stock wholesale-priced colanders, ramekins, mandolins, cast iron skillets and sieves in sizes and shapes I'm nearly certain you've never seen. On our most recent trip, we stumbled upon one previously undiscovered storefront that dabbles in the sale of antique kitchen scales, and yet another whose retail focus is vintage cash registers (along with one unlikely, and decidedly modern, POS machine). 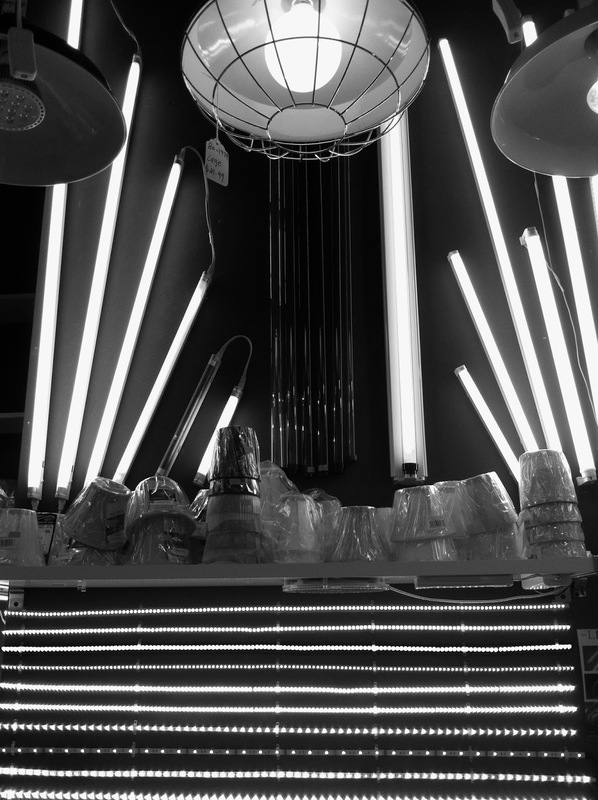 The lighting stores range from tacky (I nearly had my camera snagged by an irate employee as I tried to snap a shot of an eight-foot, illuminated crystal pirate ship), to retro (hot magenta and electric blue rods were splayed across the walls of one shop, making the whole place look like the set of an eighties music video), to dramatic (delicate chandeliers dripping layers of crystal teardrops) and pretty much every electrified option in between. Ultimately, we agreed on a series of classic black metal shades that will house large globe bulbs and will dangle from a series of track lighting throughout our dining space. I think our selection is a little bit modern, a little bit masculine, a little bit urban and a little bit vintage. You know what I mean? I'm not even sure I really do. Whatever it is, it seems to work, for which I'm grateful. It wasn't until the chef and I moved into our first place together almost a decade back -- an L-shaped apartment with pink and white tiled kitchen floors, no overhead lighting, and a mustard-colored tub -- that I grew accustomed to waking up to a house smelling of brine. That was back when the chef first entered his pickling phase -- a phase that I'm beginning to accept is not really a phase at all -- a period when no fresh fruit or vegetable found in our kitchen was safe from his salted wrath. Friends would often pop in for unannounced visits and politely inquire why our apartment smelled like feet (if you've ever engaged in some at home pickling, then you know exactly what I mean). A family member, who would so kindly offer to help set the table, would become puzzled when she opened a cabinet to find neat stacks of vintage china alongside an industrial-sized plastic paint tub filled with peppercorns, bobbing cucumbers and cloudy liquid. After a while, although we never formally agreed to it, the pickling just sort of became a part of our home, like the pile of wet bath towels that forever hang across our bedroom door or the pile of shoes that endlessly take up residence at the bottom of our stairs. I guess, in some cases, these are the things that really make a space into a home, perhaps more than subway tiles or marble countertops. These familiar smells and sights that, at one time, we find frustrating, but that eventually evolve and become comforting. Although I still dream of having glass bathroom tiles, a private yard and plank flooring, in the meantime, at least in one of our homes, we have light. Blanch the swiss chard stems for 10 seconds. Drain the stems into a colander and immediately rinse with cold water. Leaving the stems in the colander (and leaving the colander in the sink), toss with the onion and the salt. Let sit for about 1 hour. Thoroughly rinse and drain. Toast the mustard and caraway seeds over medium heat, stirring constantly, about 2-3 minutes. Remove from heat and allow the seeds to cool. Tightly pack the stems, onion and seeds into glass jars and set aside. In a small saucepan, add the vinegar, sugar and 1 cup water and bring to a boil. Remove from heat and allow to cool slightly. Pour the brine into the jars, being sure to entirely cover the vegetables. Allow the brine to cool, cover with tight fitting lids and refrigerate. Keeps for 1-2 weeks when chilled.